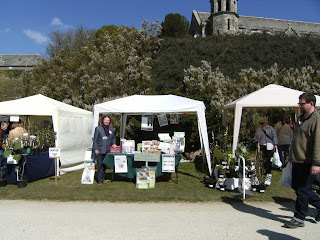 The Cornwall Flower Show, now in its 101st year, that took place over the past weekend certainly lived up to its reputation of being a fabulous early Spring event for the South West. Having set up the Heritage gazebo on Friday in a prime place in the avenue leading to Boconnoc House - which won an award in 2012 for the best Historic House renovation - the weather looked set fair for the weekend. By the time the show opened at 10am on Saturday the car parks were almost full as the better-than-expected wonderful warm sunshine brought out early visitors. One of these who passed by the Heritage stand was a lady from BBC Radio Cornwall to whom we gave a short live interview answering her query as to why Heritage was here amongst all the flower and plant exhibitors. Apart from promoting our Prize Draw to highlight the awareness of the benefits of an Online Garden Centre we said that it was a great opportunity to meet up with our friends who are Grow Your Own lifestyle exhibitors that we meet at shows around the country. Our own Grow Your Own range of planters and mini greenhouses brought several enquiries from visitors to the Show who had purchased a wide variety of colourful and unusual plants that had been carefully nurtured through the winter. We also had lots of interest in our stylish range of well-priced summerhouses. Near the house there was a small group of jazz musicians who played regularly throughout the day to further enhance the ambiance of a real Spring show day. As far as refreshments are concerned these can be rather disappointing at shows as they are predominantly limited to burger bars. The Cornwall Flower Show however was an opportunity for many local food enterprises to promote their tasty products and the main marquee for food and drink was run a by a local deli who produced a first rate range of freshly made food and drinks. The longest queue for refreshment was the ice cream van especially during the afternoon when it warmed up even more! In stark contrast Sunday was a very challenging day for both exhibitors and visitors as the weather returned to being like a raw January day with a bitterly cold easterly wind. Nonetheless, in the Great British spirit everyone tried to make the best of it. The Award Ceremony and its results were very satisfying for the respected Cornish plant growers who were the main winners. The society was keen to encourage people of all ages to become involved in gardening and there were several announcements over the tanoy inviting children to participate in gardening activities and competitions. In the Stable Yard visitors could admire the stunning camellias, magnolias and specimen daffodils that demonstrate the levels of quality experts can achieve. Even the Sunday visitors to the show looked pleased that they had made the effort to attend despite the extreme cold. Our prize draw of a pair of Joseph Bentley Ladies Lavender Secateurs and matching Flower Snips attracted many entries and was won by a lady from Liskeard.